Winter is now fully in swing and the snow has begun to fall all around the UK. With the snow comes everyone’s favourite winter friend... the common cold (Coronaviruses and Rhinoviruses) and if you're particularly unlucky, the dreaded influenza (flu!) (2). It goes without saying that the best way to stay healthy and train well is to avoid illness in the first place. However, it has been proven that high intensity training effects the respiratory system and the immune system making you more susceptible to illness. This would suggest that it is inevitable that you're going to get ill through training but this is not necessarily true and a good way to prevent illness and use training as part of a healthy life style is to be sure that you have a diet that is fit for your lifestyle and high in nutritional value. Plenty of Vitamin C "has been shown to affect some parts of the immune system and accordingly, it seems biologically conceivable that it could have effects on the increased incidence of respiratory infections caused by heavy physical stress. "(1) Which basically means, if you want to avoid getting the dreaded lurgy in the first place, eat plenty of fruits and vegetables (like oranges and green peppers) to stay healthy. If, however, you have already contracted an illness then it's time to start working towards making a recovery. So the clincher is this; does training through illness serve any benefit? Although all illnesses have different effects on the body, many symptoms are fairly common. (3) Resting heart rate and breathing are elevated causing an increase in fluid loss leading to increased dehydration. Having a fever will also directly affect how your training pays off. The higher the fever the worse the level of dehydration will be and the overall result is that any training you do will have a negative affect. When you're feeling lethargic, aching, and generally just feeling a bit crap then why bother if it’s going to have a negative effect on your sports performance? Will you benefit from exercising when ill? Many people taking part in athletic sports become obsessed with training. However, most climbers do not train specifically or often to warrant looking for this advice, so if you're reading this then you're probably in the training trap and will be reluctant to stop. The universal reason given to explain this behavior is that athletes fear losing the benefits of long periods of training by taking time off, no matter how brief. Fitness loss is real but how fast it occurs is can be hard to know. The facts are that a small brake in training will have little or no negative effects and may even have produce positive results as it gives your body time to heal. (4)Several studies have looked tackled this subject to find out the truth about how fast detraining occurs. The results were dependent on how long athletes had been training prior to stopping. For people who had been training regularly for over a year, a complete stop of exercise resulted in a loss of 50% in all measured areas of fitness after three months. For people who had been exercising for 3 months before stopping, there was a 100% loss of in fitness improvements after a 3 month break. So you can assume that the longer you have been training the longer it takes for detraining to take effect. For seasoned athletes, if you decrease the volume of training rather than stopping all together the detraining is hugely reduced. Those who have been training for a short period of 3 months suffer no negative effects from lowering the training intensity. When you're ill your body is unable to train at its standard level either way so training at this time is always questionable. What you need to ask yourself is will you gain anything from training at this sub standard ability or is it better to let your body heal? Will the recovery take longer? It has long been discovered that intense training over sustained periods of time takes its toll on the immune system. So taking part in any such intense activity would be rendered counter intuitive. However, working out at a mild intensity for short periods of time likely poses little risk to prolonging the duration of illness. Will you make the illness worse? There is no doubt that working out at high intensity training during illness will prolong recovery and make the illness worse. Also the side effects of being ill such dehydration can be a catalyst for yet more physical injuries. To decide whether you will see benefits from continued training whilst ill consider the following. Consider the location your symptoms and where they are restricted to. If they are concentrated around the head and neck only, e.g. congestion, sore throat, headache, then you are unlikely to make things worse by exercising. If however your symptoms are below the neck, e.g. cough, fever or diarrhea, then exercise may pose a significant risk to your health and well being. The majority of viral illnesses are passed by hand-to-hand contact, i.e. you touch something and then someone else does. These are fairly common knowledge and so try to avoid hugging or using someone else's computer etc. The general rule is that the day your symptoms begin to improve is the day you are no longer contagious. Start slow. If you feel well enough then increase your intensity gradually but never to your highest capacity. If you feel unwell, stop. In other words, listen to your body! Ensure you increase your fluid intake by at least 50% during your workout. Try to minimize your infectious risk to others. See a physician if your symptoms persist more than ten days or seriously worsen. Whatever you decide, train hard, train Smart and goBiG! I decided to write this article because i've been having some pain in my elbows recently which seems to becoming worse, so much so that i've decided to do some research into what it could be and how it should be addressed. The biggest problem presented in doing this is that there seems to be a lot of controversey over what is the right rehabilitation method for elbow injuries and what are the major causes. In my case its Tennis Elbow (Lateral epicondylalgia or Lateral epicondylitis) which becomes aware through pain or soreness on the outside of the elbow. If you trawl the internet you can find a plethora of articles each with its argument for the causes of Tennis Elbow. Many articles state that it's an injury caused by "overuse, occurring in the lateral side of the elbow region." However, reading medical articles and blogs from top climbers show "An intriguing new hypothesis is emerging that tendonosis might be down to underuse, rather than an overuse injury" which rings more true with myself being that I have gone from training 4 hours a day to not at all for the past 2 months and in have rarely been climbing at all. Whether it is caused by overuse or underuse the general consensus is that regular and eccentric wrist curls are a good way to rehabilitate the injury. I have found a video which I thought was a good demonstration on how to perform these rehab work outs. Please remember that if you have an injury the best person to contact for advice is a physician. This is an article I put together after a climbing accident in the Middle East. It's a full account of what happened and my feelings and reactions to a situation you never think you'll be in. Enjoy. Every climber dreams of climbing a particular route or in a certain part of the world. It might be a climb that is steeped in history or a ground breaking ascent for the era. 6 months ago that dream for me, was Jebal Misht in Oman. It all began when I graduated university in May 2011 with a degree in something which I had no interest in. See, during Uni I discovered climbing and the only thing that was ever on my mind was that! 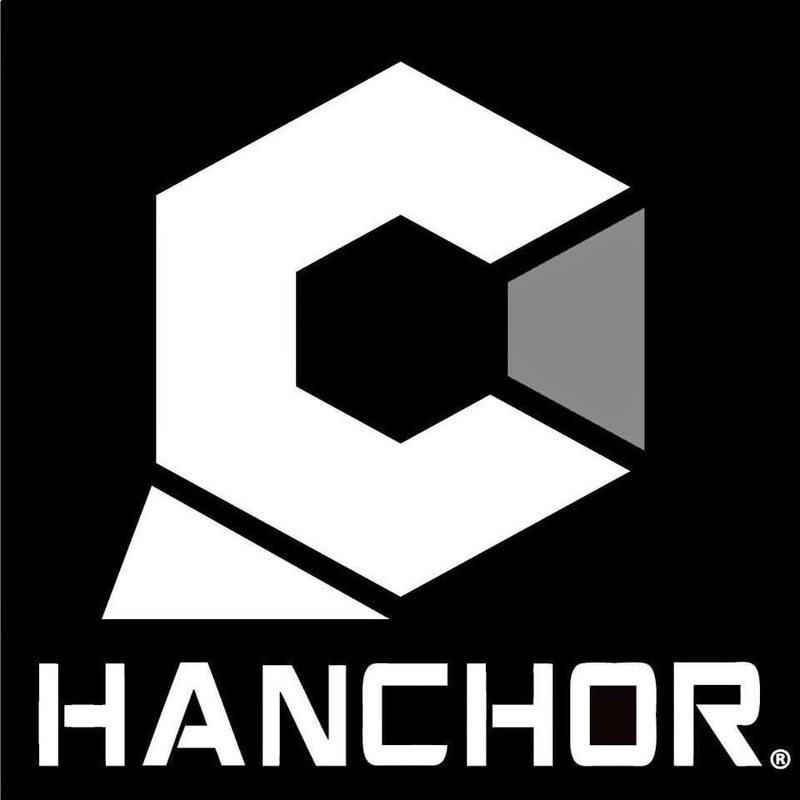 So when it came to becoming independent for the first time and getting a (REAL) job, all I could think about was how awesome it would be to work in the climbing world. I looked for jobs online and before long I got a one as a guide in Oman. Now I had never really known where Oman was let alone if there was any decent climbing there, and after a short amount of studying I was wowed by the rock I discovered. 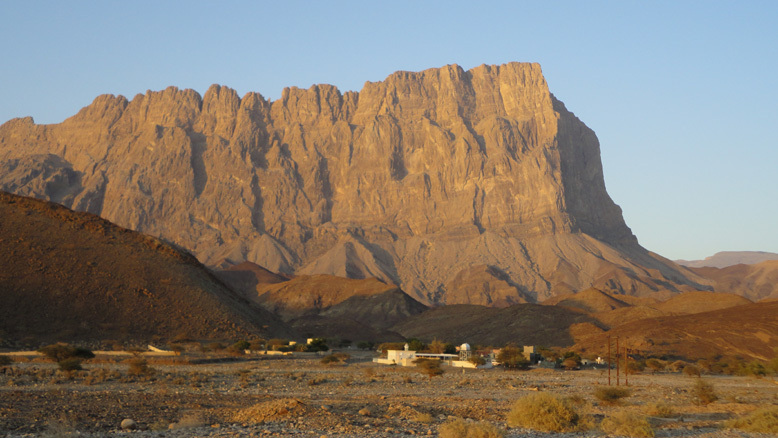 Oman is located in the Middle East just below the UAE and is country more or less made up of 50% desert and 50% mountains, one of them being a 1000m big wall called Jebal Misht. It was first climbed back in 1979 by Raymond Renaud in a "besiege" style using fixed ropes and even tactical helicopter supply drops. The remains of this ground breaking ascent can still be seen to this day, much like a hanging history of climbing with old karabiners, ropes and pitons on ledges along the route. There is rumour that after their ascent in which they covered more than 2 kilometres of climbing they were airlift from the summit to the sultan’s palace to celebrate. So now I was hooked on climbing this mountain. I had studied all the established routes up the mountain and had started reading up about big wall climbing and the techniques needed to climb such huge faces. I started practicing my hauling techniques and training every day. I knew that if I was to do this big wall I wanted to do it in one push, 1000m ground to summit in 24 hours. I decided to get some practice by climbing some of the smaller routes that were established around the country to get a feel for the rock and how to climb it. I started with a climb called Zizanne on another large rock outcrop called Al Hamra Towers to the south of Muscat where I was staying. The route we climbed was graded VII+ 5c and of this I understood little of what to expect. Being from the UK I was a custom with the E number grading system and but had never climbed anything graded with the international grades. The route went smoothly and after 300m of ascent and 5 hours later we summated. This was great opportunity to learn the characteristics of the rock and more importantly understand how quick I would need to climb to summit Misht in a day. The next time I had time off I travelled down the coast to a beautiful place called Wadi Tiwi. This place boasted giant routes from 200m - 500m and had an amazing back drop of quiet villages that looked lost in time with their donkeys and chickens running amok. I decided I would lead every pitch on this climb so that I could build some stamina for Misht and also get the head space needed for climbing continuously overrun out ground. The route we chose was Juliette Jauffret, 6b+ td+ my good friends Larry and Hamza had climbed it previously and highly recommended it. The route was climbed many years back by a French team who "retro bolted" the route. 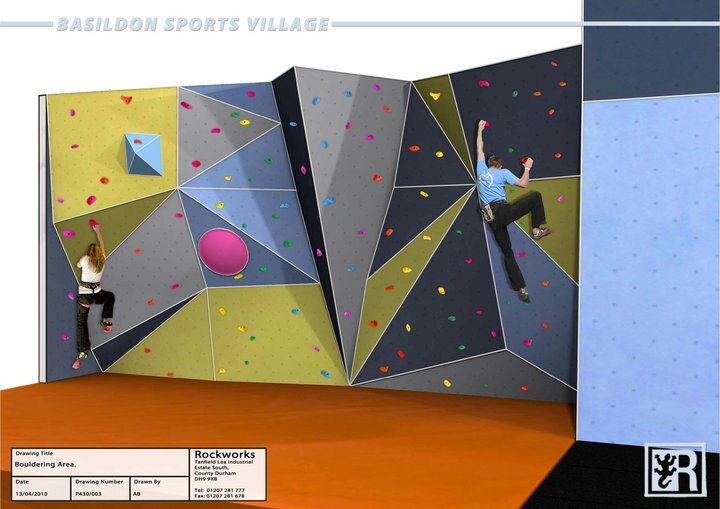 This in reality meant that it was a sport route with bolts every 10m-20m and bolted belays. I took Trad gear but found this of little help in a rock type that seems to dislike modern protection. After 6 hours we summated and were on the ground 2 hours later. I knew after this I was ready! I had climbed close to 500m of run out climbing in the heat and had some idea of how I would feel while climbing Jebal Misht and with this I began to plan my ascent. I had a few good friends that had already made hard ascents on Misht like the notoriously difficult "Icarus" route and thought they would be a great choice of climbing partner. A friend called Hamza Zidoum joined up with me for this ascent and having already climbed some big routes together we knew we'd be a good team. Hamza mentioned a new route he had tried before on the East face which tackled a giant overhang but they had not managed to climb past it. This was it, we had found our line. Hamza sent over some pictures with markings of where they had got to on the wall and we decided on how to tackle the roof and where we would head once we had overcome it. Everything had been planned for except what was to actually happen. We arrived at our base camp around 6pm after navigating the harsh river bottoms of the Wadi that run to the foot of the mountain. 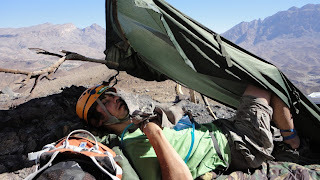 We set up a small camp, Hamza had brought a small tent and I preferring the "light and fast" approach brought a bivi bag. We had a cup of tea and looked at our route on the wall while basking in the evening sun. By the time dark had come we had racked our equipment, filled our camel backs and had a bite to eat in preparation for the 2 hour hike to the foot of the route the next day. We woke early around 3.30am and after a cup of tea and a small breakfast we got are packs together and began hiking up to the bottom of the face. We could not see where we were heading on the way up but we had a rough idea of the direction we should be heading in. At 6.30am we were at the bottom of the route looking up at the great roof while also enjoying the beautiful desert sunrise and a snack to eat. After short and well deserved rest we got our gear together and began our climb. We decided to run the first pitch together as the climbing was relatively easy. We come to a large ledge where we decided we would start the first belay. Hamza went first still having the whole rack attached to him and reached another ledge some 50m up. I came up to meet him and realised we should have also run that pitch together as he hadn't placed any protection and the climbing was fairly steady. We went up another pitch of relatively steady climbing and it came to Hamza’s lead again. 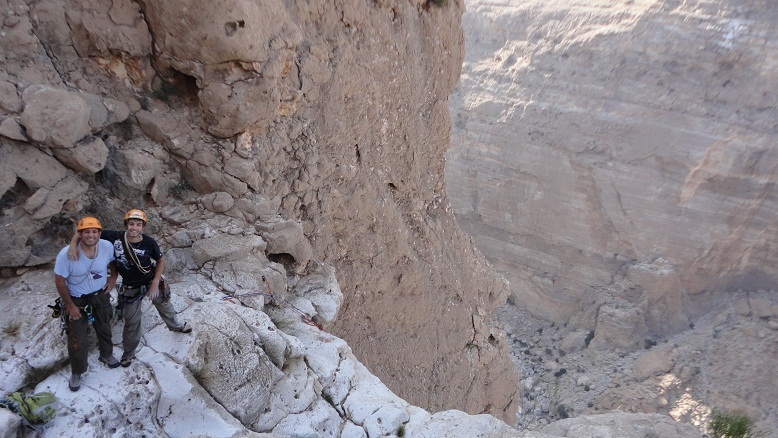 I had anchored myself to a small ledge some 6m up from a much wider one and Hamza lead up. He had placed a few pieces of protection along the way and had just slung a rock and clipped into it when all hell broke loose! While he had been attaching himself to the rock, the ropes had caught under a sizable chunk of rock about the size of a football and it had dislodge and fallen down to where I had been standing. I heard the un-forgettable chink on the wall of the rock bouncing down and instantly knew what was heading my way. As soon as I looked up to see where it was heading I felt an enormous throb in my face and felt weightless. I sat up to find the ropes taught and I was lying on the floor with blood all around me. I could see a huge flap of skin on my face hanging down and my foot was bleeding heavily. I realised fairly quickly what had happened and looking around could see the rock with a chunk of my face stuck to it. I shouted up to Hamza that I had been hit by a rock and would need him to come help me all the time trying to stay calm. I untied the ropes from me and searched in my bag for the only part of my med kit I had packed. I had brought just 3 bandages and some Oral rehydration salts having the attitude previously that if I needed more than 3 bandages I’m totally screwed anyway! I had just got them out my bag when I heard Hamza calling from above to tell me he was heading down. As I was opening the bandage packaging to I heard the shout "ROCKKKKK!" I looked up and saw large stone similar to that of the first about to land directly on my forehead. I quickly rolled out the way and it impacted on the floor where I had been sitting cutting my let and sending shooting pains down my side. I continued to crawl across the ledge hoping to get out of the fall line of any more rocks that may come loose. I looked again at my injuries and tried to identify the one that needed attention first. Although my face hurt the most it was not going to be fatal. My ankle however was bleeding a lot now and my first concern was keeping as much of that blood in me as possible. I bandaged my foot with one of the bandages, wrapping it fairly tightly around my foot in order to apply pressure hoping to stop the flow of blood on the floor. I was successful in slowing the bleeding but could not stop it. Just them Hamza arrived at the bottom and instantly began to help me dress my wounds with the hope we would both make it off this mountain alive. We pushed the flap of skin back across my face and held it on with a bandage around my head. With the remaining one we placed it around my foot again hoping to stop the blood and keep it clean for when (if!) we reached a hospital. Knowing there was no mountain rescue in the country we called the next best thing, my boss Rob. We told him the situation and found out he was close to me and that he was going to head over to try and get me down with a group of helpers, failing that he would try to get a helicopter. We were now some 200m up on a big wall with me still unable to stop the bleeding and Hamza in the predicament of figuring out how to get us down safely. We had never planned for this; I don't think many people plan for something like this to go so wrong! Being a total knowledge geek when comes to all things climbing I fashioned a back pack in which Hamza could possibly try to carry me while he set up the next abseil. I shuffled over to where he was and we abseiled down to another ledge bouncing down the rock face as I went leaving a blood trail in my wake. We continued to abseil down with not too much difficulty until we came to our original starting ledge where we had been some time earlier. We gathered food and water and decided to try out this geek tip I had read somewhere about turning an alpine coil into a person carrying back pack. After some fidgeting we managed to get me on Hamza’s back and had walked a couple of meters when we decided it weren’t such a good idea. If Hamza was to trip and fall he may have fallen off the edge of a 200m drop taking both of us with him and with my useless weight on his back it seemed a likely possibility how we were going. I got off his back and decided I would "bum shuffle" my way down the mountain. This way of moving was much safer than the back carrying but was incredibly painful if I caught my foot not to mention that I was wearing through the seat of my trousers and through my underwear whilst dragging my now useless body around. After 3 hours of shuffling and roughly 250m of descent later I was exhausted and was losing consciousness. Knowing a party of people was on the way I urged myself to continue to a possible helicopter landing point should it be needed. As we reached the small flat area I lay back and drank a small amount of water not knowing how long we would be there. Not long after getting there we saw a figure approaching in the distance. At first we couldn't make out what it was, thinking it could just be one of the local’s goats that wonder the hills. As the figure grew nearer we realised it was not a goat but my 55 year old boss sprinting up and down the hill towards us. What had taken us hours to walk seemed to take him minutes to run and he was soon with us. He took one look and said "we're gonna need a helicopter..." My heart sank thinking how long would I be on the side of this mountain. I was already lying flat out in the boiling mid day sun, unable to find shade and I was still bleeding. He then produced a sleeping bag and a bottle of water in which we could make a shelter and keep hydrated which brightened our spirits. He then left again saying a helicopter was on its way and he had been told by the police it would be there in 30 minutes. With the supplies from Rob, Hamza created a great makeshift shelter to cover us from the sun and while I cut off what was left of my trousers legs to make more bandages to tie around my foot and the wait began. 1 hour passed and it felt like my body had gone through a roller coaster. The pain was slowly getting worse and I was trying to keep cool headed about the situation knowing that if I panicked it would only makes things worse and wouldn't help me in the slightest. While Hamza continually tried to find out where the helicopter was and when it would be here the hours passed. After 8 hours of waiting I was mentally and physically exhausted. The baking heat of the day had all but drained my energy and moral. I was now becoming so weak I could barely lift myself around and it was beginning to get dark, dashing all my hopes of a helicopter rescue. By hour 10 we heard helicopter rotors and we both knew it must be the one we had been waiting for. It came into view but flew straight passed us, not noticing the H landing pad Hamza had laid out in stones or us waving our colourful jackets in the air with our head torches flashing. It then suddenly dawned on me how impossible it must be to see two tiny specs at the bottom of a huge wall even with all the preparation we had done. It continued to fly around while Hamza tried to navigate it towards us by calling the pilot on his mobile. He still couldn't find us and the night as drawing in. I knew if it got dark they would call off the search until tomorrow and I had an uncomfortable feeling about how long I would last if. Just as the helicopter was looking to leave it came towards us and we made all the noise we could and waved around everything we had in the hope of being seen. It continued getting closer and we knew it had seen us! It circled around and attempted to land but with the high crosswinds was unable too. Just then the side door of the helicopter came open and a winch man was lowered down. I crawled over to him, clawing at the ground in desperation to be as far away from that place as possible. He then slung me with a harness and began winching me up. As we reached the door I flopped onto the floor and we circled round to make a second pass for Hamza who had waved the chopper to leave him. We flew to a nearby hospital where I was transferred to Ibri and taken care by a great team of doctors and surgeons. After several stitches to my face, inside my mouth and my ankle I was put to rest in the ward where my friends came to visit. Hamza came to see me and told me how he had carried both our equipment down the mountain to the vehicles and then drove for 4 hours to the hospital which makes him not only a good friend but a true hero in my eyes. 2 days later I was released with crutches and a cast on my ankle and sent home to rest. I cannot help but think how lucky I was to survive such an accident. If it had not been for the amazing efforts of my friends and the helicopter crew the situation could have been much worse. I plan to go back to Oman and finish our route sometime soon but with a healthier respect for the mountains and my environment. If I could take one lesson from this it would be that it doesn't matter how good a climber you are, accidents do happen and learning how to get out of them before they happen is invaluable! Its now been 7 months since i started my job as centre manager at High Sports. When began work there it was a totally new wall, all i had to go on was the photos given below. Since i began i have poured everything i have into making the wall succeed and grow. Although i am leaving after a short period of time i feel there is nothing more i can do to help the wall progress, it simply needs to continue on the path i have lay out for it of being active, freindly and non elitest. We have turned complete beginners into 7a beasts (Tony, Steve - you guys earnt it!) in just 5 months and hosted numerous events which have brought us together as a climbing community. 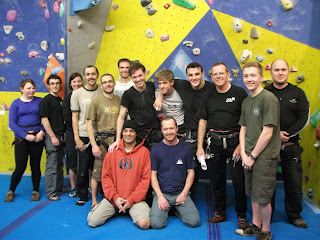 We held the 2011 Reel Rock Film Tour, started our own climbing club and and raised money and good for numerous charities. 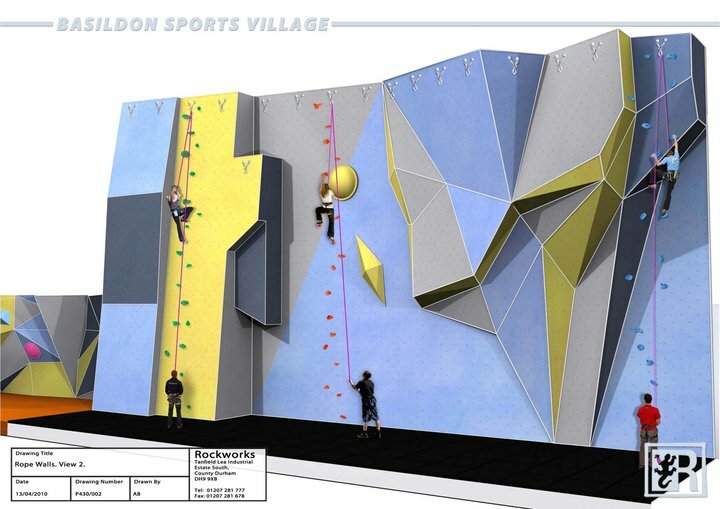 Its fair to say i will miss the people that i work with as they have been an important contributing factor to the walls amazing success not only in reaching and breaking targets but also encouraging new climbers to the wall. I want to thank you all for making my time in Essex a great experience and will keep in touch with you guys via this blog and Facebook as we go.